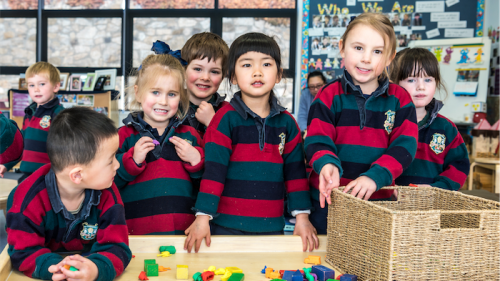 AN expansion to the Canberra Girls Grammar School Early Learning Centre (ELC) means more boys and girls can engage in its unique program, says director Kate Columbine. The program encourages children to be creative and curious and that’s why Kate says she can’t wait to welcome 66 new students into its additional three classrooms and its new facilities in 2019. Since opening in 2004, the ELC on Grey Street, Deakin, has been a nurturing learning experience for boys and girls from the ages of three to five in two seperate year levels (reception and pre-prep) as well as before and after-school care, and holiday programs. “Since the beginning, we’ve always had a good number of boys and girls come through and that’s expected to continue,” Kate says. The ELC program is based on Canberra’s early years learning framework, in conjunction with the International Baccalaureate Primary Years Program. “With these frameworks as a foundation, we really focus on tapping into children’s natural sense of curiosity and creativity, and providing them with lots of engaging experiences to help them learn about the world around them and their place within it,” she says. The new wing being built will expand on these creative experiences, with a multipurpose art area coming off each classroom, which Kate says will provide a great space for messy science activities and group work. “There are also two additional outdoor play spaces being developed as part of the expansion; one on the ground floor and one on the upper floor,” she says. Unlike other childcare centres, each class has a full-time university trained early childhood teacher and a diploma-trained assistant because, Kate says, early childhood is a really important phase of development. “Having these university trained early childhood teachers is something that really emphasises that educational focus,” she says. Each term, classes have a “unit of inquiry”, which focuses on a “big” idea to inquire into. “This provides an element of structure to the program, but is very open to the interests and needs of the children, and they effectively guide the direction of the program,” Kate says. But the children don’t just learn about “inquiry” and the ELC ensures all areas of development are fostered such as literacy, numeracy, fine motor, gross motor, social, emotional and STEM. “We have a strong focus on foundation literacy and numeracy skills, and seek to provide children with opportunities to develop these skills through fun and engaging play based activities,” Kate says. Children also get to experience library and music sessions with specialist teachers. “They visit the library and music rooms every week, and love exploring the array of books and musical instruments they find in these spaces,” Kate says. Kate says there’s so many great reasons for children to experience their ELC program, which is why it will open its doors on September 19 so parents can come and have a tour of the ELC in person and learn more about what it has to offer. “Alternatively, we are always happy to give parents individual tours,” she says. “We’re really warm, welcoming and nurturing and we provide each family with an individualised experience where our teachers know the child and their family and their extended family.